The Scorecard FAQs below refer to the 2003-2004 legislative session (the most recently completed session). We are currently creating the Mass Scorecard for the 2005-2006 session. You can see a sample of the 2005 House votes online now. We will post the complete Mass Scorecard voting records for all legislators prior to the September 2006 primaries. You can find the new party platform linked from our new House votes list also. The Mass Scorecard publicizes the voting records of all Massachusetts legislators in comparison to the Democratic Party platform. It is a major means of achieving open government and issue-based accountability. We passed a party platform amendment in 2003 to implement it and are working towards that end. Click on State House or State Senate and then a legislator's name, to see their scorecard. 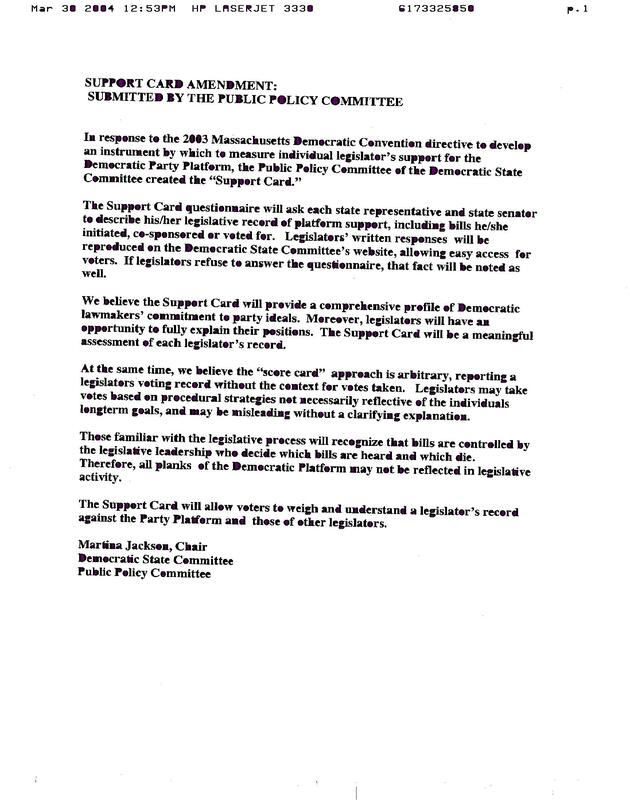 We made an agreement with the Public Policy Committee of the Massachusetts Democratic Party to implement a version called the Platform Support Card by Sept. 1, 2004. The Democratic party leadership failed to meet that deadline. We need your help to overcome obstacles within the Democratic Party and as a show of support, for future implementation of the Mass Scorecard. We are asking for endorsements by Democratic Committees and political groups, as well as for individual sign-ups to show widespread support. With your support, we will achieve implementation within the Democratic Party next year. Please contact us at 617-256-5641 or marty@MassScorecard.org. Q & A Questions from Scorecard critics and answers from Scorecard proponents. House votes used on the scorecard, plus list of some rejected votes and the criteria for rejection. What is the Mass Scorecard? What is the purpose of the Mass Scorecard? How will the Mass Scorecard be presented? What is the relationship between the Mass Scorecard and the Mass Dems? What is the party platform? What is the Issues Convention? What is the Accountability Amendment? What are the Progressive Democrats? Why are some people against the Mass Scorecard and how do you respond to them? What’s the story with the Massachusetts Senate? Tell us about the process you will use. How will the website be structured? How do voters compare one legislator to another? What about when a legislator is absent? What about challengers in electoral campaigns? How will you decide on which votes to use? How do I join the Progressive Democrats? How can I help build the Mass Scorecard? How do I join CPPAX? How do I support the website? Q: What is the Mass Scorecard? A: Until the Massachusetts Democratic Party carries out the vote of its Issues Convention from June 2003 the Mass Scorecard will be the implementation of the Accountability Amendment which passed 60% to 40% at that convention. Q: What is the purpose of the Mass Scorecard? A: Our mission is to provide information to the voting public about how legislative voting records relate to the Massachusetts Democratic Party. Our purpose is to expose voting records to the public, and to show the degree to which each legislator adheres to the party platform. Q: How will the Mass Scorecard be presented? We are publicizing Democratic elected officials’ voting records as recommended in the party charter. A: The Mass Scorecard is a project of the Progressive Democrats of Somerville* and CPPAX (Citizens for Participation in Political Action), with the technology provided by OnTheIssues.org. This coalition of progressive organizations prepared the Issues Convention resolution and undertook the work to get it passed. We encourage participation in our coalition by other progressive groups, especially local chapters of the Progressive Democrats of Massachusetts. The technology behind the Mass Scorecard is adapted from OnTheIssues.org, which provides voting records on-line for federal legislators. Q: What is the relationship between the Mass Scorecard and the Massachusetts Democratic Party? A: We intended to create the Mass Scorecard in conjunction with the Massachusetts Democratic Party and as an official document of the Massachusetts Democratic Party. The Mass Scorecard currently has no formal connection with, nor authorization from, the Massachusetts Democratic Party. We negotiated with representatives of the Massachusetts Democratic Party leadership for 14 months to implement the Mass Scorecard before giving up and implementing it on our own. The Massachusetts Democratic Party leadership responded by removing our representatives from the relevant committees. (More details here). Q: What is the party platform? A: The party platform is the document that defines what the Massachusetts Democratic Party believes in. Few people agree with the platform 100%, but calling yourself a Democrat means you agree with most of it. Q: What is the Issues Convention? A: It’s where the Massachusetts Democratic Party gathers to decide on the content of the party platform, once every four years, most recently in 2001. In between, Issues Conventions amend the platform with an Action Agenda. The Issues Convention in June 2003 amended the 2001 platform, and hence the Accountability Amendment is part of the 2003 Action Agenda. Our coalition had numerous members who were elected as delegates to the Issues Convention. Q: What’s the party charter? A: The party charter defines the rules of the Massachusetts Democratic Party, as decided at the Issues Convention. While the platform provides guidance to legislators on how the Massachusetts Democratic Party expects them to vote, the party charter provides guidance for internal party matters. Q: What is the Accountability Amendment? We call for promoting accountability to the Party Platform and reinforcing the Party’s commitment to social and economic justice, by publishing a ‘scorecard’ by March 1 of each year, indicating how Democratic legislators voted on 10 fundamental issues from the current Party Platform. The floor vote resulted in a 60% to 40% passage of the Amendment. Q: What are the Progressive Democrats? A: The Progressive Democrats of Somerville originally developed the idea for the Mass Scorecard. The Progressive Democrats of Massachusetts, a still-in-formation organization, has no formal connection with the Mass Scorecard, except that the people involved overlap. If you're interested in joining the Progressive Democrats of Somerville or the Progressive Democrats of Cambridge, or you would like to work on the Mass Scorecard, please contact us at Membership@MassScorecard.org . A: Citizens for Participation in Political Action is one of the oldest progressive organizations in Massachusetts. CPPAX formed in the 1960s and has worked on progressive issues from establishing the nation’s first Earth Day in 1971, to the Clean Elections campaign in 1998-2002. CPPAX is also a membership organization -- if you are interested in joining, or to learn more about CPPAX, go to www.CPPAX.org . Q: Why are some people against the Mass Scorecard and how do you respond to them? A: Former Rep. Mickey Edwards (R, OK) published an article in the Boston Globe saying that the Mass Scorecard would help Republicans by pushing legislative candidates to the left. We disagree – we think that many independent voters will view the Mass Scorecard as a sign of the health of the Massachusetts Democratic Party, and will become more involved with electoral politics as a result. In particular, new voters and previously disaffected voters will view the accountability associated with the Mass Scorecard as a signal that the Massachusetts Democratic Party is addressing the desires of independent voters. Scot Lehigh published an op-ed in the Boston Globe concluding that the Issues Convention should be canceled rather than push the Democratic party from centrist to progressive. We conclude that the Mass Scorecard will make the Issues Convention a more meaningful venue to debate what the Democratic Party should stand for, and that that process would invigorate the Democratic Party as well. More recently, we appeared on Newton Cable TV (videotape available upon request or you can download it) and in an article in the Newton Tab (PDF). Q: What’s the story with the Massachusetts Senate? A: In September 2003, we made a mistake by leaving a pilot website on the Internet for too long. We created a pilot, with meaningless sample votes, to illustrate how the Mass Scorecard computer system would work, so we could demonstrate it to our fellow Democrats and establish a process for creating the Mass Scorecard. We intended it as a private website, but Google.com somehow indexed it (a testament to their efficiency). It contained only 4 votes – not enough for any rigorous analysis – while the final Mass Scorecard will include perhaps three dozen votes. A senate aide found the Mass Scorecard on Google, then photocopied it and distributed it on the Senate floor. The information in the pilot was never intended for public dissemination and was entirely to demonstrate the technical aspects of the Mass Scorecard system. Accordingly, once we discovered that we were listed on Google, we removed the content of the Mass Scorecard. We have now re-posted the Mass Scorecard with meaningful content. In the interim, we tried (and failed) to establish the details of that process, in conjunction with the Massachusetts Democratic Party. Q: Tell us about the process you will use. A: We attempted to develop a complete process for selecting the votes in the Mass Scorecard and for how those votes are presented, under the auspices of the Public Policy Committee of the Massachusetts Democratic Party. That committee includes state representatives, state senators, and Democratic State Committee (DSC) members. The DSC as a body would vote annually (at the November or December DSC meeting) on accepting or modifying the process. We would then select the votes to include on the scorecard, with that same group absent the elected legislators, since their votes are the ones being scored and they therefore might be seen as having a conflict of interest. Our coalition would then implement the scorecard according to the methods defined by the Public Policy Committee and approved by the DSC. An outline of the process appears below – this would have been a first draft subject to modification by the Public Policy Committee. Q: How will the website be structured? How the legislator actually voted on that issue (yes or no). Pop-up pages including the full text of the relevant section of the party platform, to a fuller description of the vote, to the bill or budget section being voted on, and to the House and Senate Journals where the official voting record can be found. The bottom line of the legislator’s webpage would sum up how many votes which were in agreement with the platform’s recommended vote. We would then do the same for each member of the Massachusetts Senate, using a modified set of Senate votes, only some of which had corresponding House votes. Q: How do voters compare one legislator to another? A: We list a summary page of all of the legislators for easy navigation. Viewers can bring up two pages side-by-side. We intend to eventually include primary challengers. A similar method would apply to the Senate. Q: What about when a legislator is absent? A: There are three methods to deal with absences. First, the score is based on the votes a legislator has cast. Hence a missed vote is neither counted for nor against a legislator. Second, any legislator can insert into the House Journal or Senate Journal (the official record of the proceedings of the legislature) how they would have voted, had they been present. We include those insertions as if the legislator actually voted. Third, we allow legislators to report to us how they would have voted, if they did not take the opportunity to insert their vote into the House and Senate Journals, with an appropriate note indicating the unofficial nature of the voting record. Q: What about Republican legislators? A: We score Republicans in the same manner as we’re scoring Democrats, with their votes compared to the Democratic Party Platform. Of course Republicans have no obligation to adhere to the Democratic platform, and presumably their scores will reflect a difference in philosophy. We think citizens will find the Republicans’ votes much less in alignment with the Massachusetts electorate than the Democrats’ votes, which is one of the motivating factors for our creation of the Mass Scorecard. Q: What about challengers in electoral campaigns? A: We will allow challengers to report to us how they would vote on each issue included on the scorecard. Challengers may also comment on each issue, indicating why they would vote the way they indicate. Incumbents may also provide comments on each vote, but do not have the opportunity to change their voting record. Q: How will you decide on which votes to use? Only roll call votes -- no voice votes, no bill sponsorships, etc. No omnibus legislation (such as vote on the entire budget bill, because the purpose of the legislator's vote is unclear). No constituent service votes, nor any votes that apply primarily to one locality (such as funding for a hospital or court in one legislator's district, since the vote depends more on geography than on one's stance on the issues). Count only one vote in a series of amendments, or only one vote on any given topic (to avoid over-weighting one issue over others). No unanimous or near-unanimous votes which likely have some other political component hidden from the apparent vote. Count only votes that clearly address a platform issue, as expressed in the platform, and as the core issue of the vote. Vet all votes by confirming with Democratic State Committee representatives on a confidential basis that the selected votes meet the criteria above, that the descriptions and platform links are fair and accurate, and that the vote is a fair representation of the legislators’ views of the corresponding section of the party platform. Q: How do I help? A: First, sign up on our e-mail list. Second, join one of our coalition organizations or help us directly with volunteer labor. Third, write in support of the Mass Scorecard. Fourth, we accept donations. Q: How can I help build the Mass Scorecard? A: We are an all-volunteer coalition and could use your help. If you are interested in working on the Mass Scorecard, please contact us at MassScorecard@MassScorecard.org . If you would like to write a letter of support, send an e-mail to that same address. Q: How do I join the Progressive Democrats? A: The Progressive Democrats of Somerville and the Progressive Democrats of Cambridge have regular meetings -- contact us if you're interested in getting involved. Look for our next meeting dates on our websites. We are not affiliated with the Progressive Democrats of Massachusetts -- their website is www.progressiveDems.org. We are not affiliated with the Progressive Democrats of America -- their website is www.pdAmerica.org. Q: How do I join CPPAX? A: Citizens for Participation in Political Action is a membership organization with annual dues and regular meetings. If you are interested in joining, contact CPPAX@MassScorecard.org . Q: How do I support the website? A: The Mass Scorecard website is hosted by OnTheIssues.org, which is part of the Speakout Foundation, a not-for-profit organization. The Speakout Foundation accepts tax-deductible contributions as a 501(c)(3) corporation. You may send donations to 1770 Mass Ave, #630, Cambridge MA, 02140. Q: What's REALLY going on here? A: To get the political story beyond the basic facts, read more.